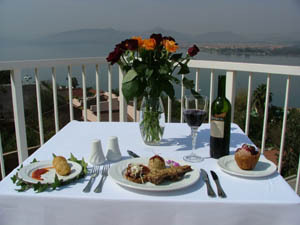 Discover a little old-world Italian romance nestled in the picturesque village of Kosmos…Breathtaking 180 degree views of Hartbeespoort Dam set the scene for intimate dining, gourmet picnics, sunset cruises and spa treatments in the privacy of your luxurious suite with en-suite spa bath/Jacuzzi. The ultimate in indulgence, this inspiring haven offers outstanding hospitality and exceptional personal service. La Dolce Vita is dedicated to weaving a little magic - sharing the enchantment of this truly unique guest experience. These are tastefully furnished with Queen or king-size beds, wingback chairs, TV, tea & coffee stations, three with balconies and three with cosy garden patios. All command magnificent views of the water from the en-suite Jacuzzi/Spa baths. Slightly larger than the others, these suite are elegantly furnished with king-size beds, lounge, TV, tea & coffee stations, mini bar, balcony and Jacuzzi/Spa bath overlooking the dam. 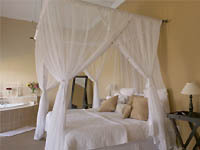 Depending on the season we either offer complimentary roses or aromatherapy baskets with these rooms. Both command spectacular views of the water. These rooms are set aside in a tropical garden to maximise privacy and take you back to the old romantic colonial way with king size beds covered in white crisp Egyptian cotton, all commanding great views of the dam from their respective balconies. Bathroom equipped with Jacuzzi/Spa baths and for the free at heart we offer outside showers or a bath. All equipped with mini bars, TV’s and DVD players. For winter they offer fire places and under floor heating. In the Bali house we offer four tastefully decorated suites, two with their own fire places and all commanding great views of the dam. All have full bathrooms, but no spa baths. A central honesty bar and tea & coffee station serves these rooms. A great option is to rent the whole house for your group breakaway. * Our Honey moon Aromatherapy Experience – A basket of sensual oils and relaxation therapy treats. We now boast our very own chef who cooks up a storm on Friday and Saturday Nights as well as for private parties and conferences. We offer a three course set menu in our romantic Safari restaurant rounded off with Italian coffee and Belgium chocolates. On Weekends we offer our guests a 2 hour sunset cruise on our very own launch boat “La Jennifer”. 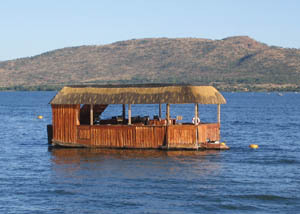 There is just something to be said about drifting silently across the water shadowed by the Majestic Magaliesburg Mountain Range. For the more adventurous we tag along the ski-boat. Guests can also be collected from the cruise and taken on a Para-Sailing adventure. Guests can enjoy a special gourmet picnic on the shores of the dam as well as a host of water sports including water skiing, tubing or riding the dragon for the more adventurous. And, as the soft glow of sunset paints the sky a palette of soft rose and apricot, you can board the launch boat and enjoy sundowners and snacks as we cruise the Dam. Visit the Lesedi Cultural Village for a unique african experience. Quad Bike Trails available for you to enjoy! Balloon Safaris with Bill Harrop: Join Bill Harrop for this unique experience - elegant, eccentric adventure in space and time, hovering at tree top level while you wave to local farmers below. Weather permitting; your pilot will take you soaring high among the clouds whilst you sip champagne. Your "720" degree wrap-around panorama view of the Magalies River Valley will leave you breathless. Bookings are essential and we will be more than happy to assist! Horse riding trails: These are available from Lenoch Tours - a proud family history of horses since 1865 - with an exceptional selection of well-schooled horses. Para-Sailing: The truly adventurous can enjoy the freedom of para-sailing at various locations in the area. World-class Golf at Pecanwood: This pristine 18-hole was designed by Jack Nicolas and the multitude of quaint and cosy pubs and sports bars in the area takes care of the 19th put! Fly fishing: Catch the big one or at least have the opportunity to boast about it! The astounding natural beauty of your setting also provides several trout-laden streams and brooks. Elephant Sanctuary: The Elephant Sanctuary is a mere 5 minute drive from the guest house and offers two daily programs for you to experience the delight in discovering the different characters and personalities of these African elephant. Art Galleries and Markets: An artists' haven has developed around Hartebeespoort Dam which is sure to keep you enticed for more than a day. Kosmos Nature Trail: Take a picnic bag and enjoy a romantic 2 hour strolee along the Foreshore returning via one of the quaint lanes that make Kosmos such a special place. The Zoo: Visit the zoo and experience nature up-close. Glen Afric Game Drives: See the big five as you have never seen them before. The aquarium: Visit the aquarium and discover a whole new world under the water.